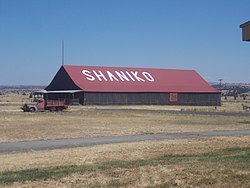 Shaniko (/ˈʃænɪkoʊ/, SHAN-i-koh) is a city located in Wasco County, Oregon, United States, on U.S. Route 97 and about 8 miles (13 km) north of Antelope. The population was 36 at the 2010 census. Shaniko is in Wasco County, in north-central Oregon, at the intersection of U.S. Route 97 and Oregon Route 218. The city is 69 miles (111 km) north of Redmond and 131 miles (211 km) east of Portland. According to the United States Census Bureau, the city has a total area of 0.50 square miles (1.29 km2), all of it land. The city is at an elevation of 3,343 feet (1,019 m). On the high plateau on which Shaniko was built, the soil is thin and the vegetation sparse, consisting mainly of sagebrush, bunchgrass, and occasional junipers. Many peaks of the Cascade Range, including Hood, Jefferson, Adams, St. Helens and Rainier, are visible from the city. The first European Americans came to the Shaniko area after the discovery of gold in Canyon City, Oregon, in 1862. The route to Canyon City started at the early settlement of The Dalles, 190 miles (310 km) away. Camps were made wherever water could be found. One camp, which became the farming community of Bakeoven, was closely associated with the future town of Shaniko, while another camp, Cross Hollow, was within the present Shaniko city limits. In 1867, following complaints of hostile Indians and fear of robbery of those transporting gold, the State of Oregon received a grant from the United States government to build a military wagon road from The Dalles to Fort Boise, Idaho. Following this road, homesteaders began claiming land in Central Oregon that had been fairly inaccessible. The town's heyday was the first decade of the 20th century, when Shaniko served as a transportation hub spurred by the presence of the Columbia Southern Railway, a subsidiary of Union Pacific Railroad, which built a branch from Biggs Junction to a terminus in Shaniko. That branch was completed in May 1900. At the time, the city was known as the "Wool Capital of the World", and it was the center of 20,000 square miles (52,000 km2) of wool, wheat, cattle and sheep production, with no other such center east of the Cascade Range in Oregon. The region served by the city even stretched into Idaho, south to Klamath Falls, Oregon, and beyond, because of rail connections to the main line. In the mid-1980s a man named Jean Farrell came to town and wanted to restore the old Shaniko Hotel building. That dream did not come to fruition and the hotel was sold in 2001 to Robert Pamplin Jr with high hopes that it would be restored completely and revive tourism to the town. Though the hotel was listed for sale for quite some time, it has been taken off of the market. Though many tourists still stroll the streets of “Oregon’s Ghost Town”, a wastewater issue still prevents any large scale tourism efforts from forming. Unfortunately, the infrastructure issues created a major roadblock and the hotel remains closed. Shaniko still tops the list of many ghost town tour searches. Local residents would prefer that people know that Shaniko is “out where the west still lives” as opposed to a ghost town, as if nothing is there . They work to not only preserve the history, but to share it. There are several small business who operate from April through September, when tourists come through in a steady stream from Highway 97. Of particular interest is a collection of old buildings that residents hauled to town from various locations called “Shaniko Row”. Artifacts are displayed throughout this collection and displays a business that would have existed a century ago. The Shaniko Stagecoach Station sells sodas and other items of interest. During the summer, the establishment shares Western experiences in their unique display of a cowboy camp, complete with a sheepherder wagon. It is also known as a music venue providing a Ragtime or Bluegrass experience as well. For the day trip enthusiast, a self-guided walking tour will provide a thorough guide through historical sites and views with explanations of their importance . Events provide fundraising opportunities to sustain this little town. The event list includes entertainment such as impromptu historical re-enactments, musical entertainment, and usually a community meal. As of the census of 2010, there were 36 people, 17 households, and 11 families residing in the city. The population density was 72 inhabitants per square mile (27.8/km2). There were 24 housing units at an average density of 48 per square mile (18.5/km2). The racial makeup of the city was 75% White, 8.3% Asian, and 16.7% from two or more races. Hispanic or Latino of any race were 8.3% of the population. There were 17 households of which about 18% had children under the age of 18 living with them, about 53% were married couples living together, about 6% had a female householder with no husband present, about 6% had a male householder with no wife present, and about 35% were non-families. About 29% of all households were made up of individuals and about 18% had someone living alone who was 65 years of age or older. The average household size was 2.12 and the average family size was 2.55. The median age in the city was about 55 years. About 17% of residents were under the age of 18; about 3% were between the ages of 18 and 24; 19.5% were from 25 to 44; about 28% were from 45 to 64; and about 33% were 65 years of age or older. The gender makeup of the city was about 58% male and 42% female. Shaniko Historic District, including the Columbia Southern Hotel, the city hall and jailhouse, a schoolhouse, and 42 other properties, some of which have been renovated. The NRHP nomination form for the district provides historical details, references, images, and descriptions. ^ "Incorporated Cities: Shaniko". Oregon Blue Book. Oregon Secretary of State. 2013. Retrieved August 13, 2013. ^ a b "U.S. Gazetteer: 2010, 2000, and 1990". United States Census Bureau. Retrieved August 13, 2013. ^ "Population Estimates". United States Census Bureau. Archived from the original on June 17, 2013. Retrieved June 2, 2013. ^ a b c d e f "American FactFinder". U.S. Census Bureau. Retrieved August 8, 2013. ^ a b "Shaniko". Geographic Names Information System. United States Geological Survey. November 28, 1989. Retrieved August 11, 2013. ^ Oregon Atlas & Gazetteer (7th ed.). Yarmouth, Maine: DeLorme. 2008. p. 76. ISBN 978-0-89933-347-2. ^ "Shaniko Community Profile". Infrastructure Finance Authority. 2009. Retrieved August 8, 2013. ^ a b Almquist, Leonard (February 28, 1980), National Register of Historic Places Inventory — Nomination Form: Shaniko Historic District (PDF), retrieved August 13, 2013 . ^ a b Shaver, F. A.; Arthur P. Rose; R. F. Steele; A. E. Adams (1905). An Illustrated History of Central Oregon Embracing Wasco, Sherman, Gilliam, Wheeler, Crook, Lake and Klamath Counties. Spokane, Washington: Western Publishing Co. pp. 169–71. OCLC 5436491. ^ a b c d e f g h i j k l m n o p Rees, Helen Guyton (1982). Shaniko: From Wool Capital to Ghost Town. Portland, Oregon: Binford & Mort. ISBN 0-8323-0398-4. ^ a b c d McArthur, Lewis A.; Lewis L. McArthur (2003) . Oregon Geographic Names (7th ed.). Portland, Oregon: Oregon Historical Society Press. ISBN 0-87595-277-1. ^ a b Culp, Edwin D. (1978). Stations West, The Story of the Oregon Railways. Bonanza Books. pp. 100–01, 125. OCLC 4751643. ^ The Shaniko Preservation Guild. (2007, January). The Shaniko Sage. Self Published, pp. 1–2. ^ Craig, L. (2007). Don’t Be Sheepish Shaniko. Columbia Gorge Magazine, unknown(unknown), 19–23. ^ Moffatt, Riley Moore (1996). Population History of Western U.S. Cities and Towns, 1850–1990. Lanham, Maryland: Scarecrow Press. p. 215. ISBN 978-0-8108-3033-2. ^ Luckman, Katharina L. (January 1979). "National Register of Historic Places Inventory Nomination Form: Columbia Southern Hotel" (PDF). National Park Service. Retrieved August 13, 2013. ^ Carver, Jeanne (November 22, 1993). "National Register of Historic Places Registration Form: Imperial Stock Ranch Headquarters Complex" (PDF). National Park Service. Retrieved August 13, 2013. This page was last edited on 28 November 2018, at 07:03 (UTC).